Crystal Bleu Dvorak is an audiologist at Rehder Balance & Hearing Clinic in Billings, MT. She has been a ReSound customer since 2008. She recently surprised her husband with a vow renewal while they were in New York City for a ReSound meeting! This year we celebrated our 10 year anniversary. We didn’t have time to plan a “real” wedding 10 years ago due to my husband being deployed to Iraq. We threw what little bit we could together in two days. We had a more formal renewal ceremony (organized by my husband’s family) for our 5 year anniversary. We thought it was so cool we said we’d do it every 5 years. This year slipped away from us, so I decided to incorporate it into this trip to NYC as a surprise for my husband. My husband knew nothing of my plans, but I thought that NYC would be a great location. Originally, I was going to have a dress and veil in a back pack and slip into a bathroom and change. I was considering Central Park, Statue of Liberty, etc. I wasn’t really sure what I was going to do, but wasn’t too concerned, I knew it would come together. The plan fell in place when I found out we were visiting the Rockefeller Center Christmas Tree. I thought that would be the perfect place. I figured my husband would be suspicious if I wore a wedding dress, so I chose a different dress, knowing that a veil would pull the look together. I know my hubby thought me wearing a dress was odd considering the weather, but he was smart enough to keep that to himself! I had pre-arranged with Rodger Bakke from ReSound that he would get my hubby and I talking about how long we had been married and then our conversation would lead the way. 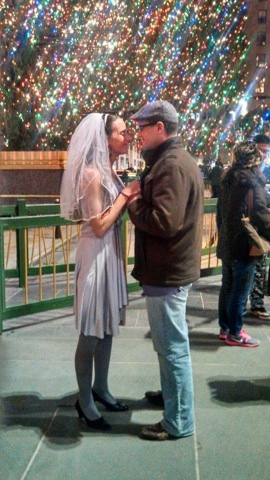 I handed off the veil to a bystander and had another bystander take pics (I literally met them two minutes before). When I took off my knitted Minnesota Vikings hat, he started to wonder what was going on. We were mid-conversation, talking about how we had planned on renewing every 5 years, but this year got away from us…. Then, I put on the veil and said “there is no time like the present!” My husband was super surprised. He was even more surprised that our daughter knew and kept the secret. The day we got home to Montana, my family stopped by a pet store to get cat food. We ended up seeing a Min-Pin puppy and adopting him (shocking since I am NOT an dog person). We named him Rocky (after the Rockefeller Center). Definitely a trip to remember!